Essential oils have been around a long time. Thanks to social media, they're much more popular than they've ever been. Still, the basics of essential oils remain the same. If you've been curious or just want to see how we use them, here we go. 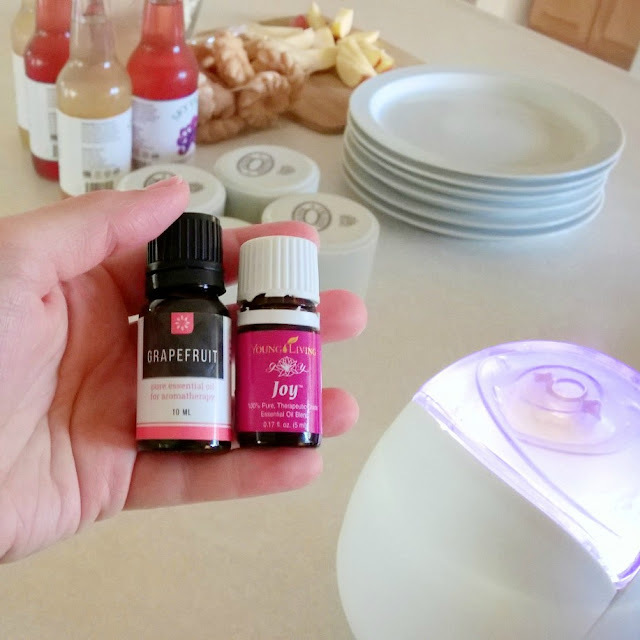 This will be my one-stop post for all things essential oils: How we use them, safety reminders, and tips for getting started. If I have anything to add or change, it will be done in this post. The benefits of using essential oils are as many and as diverse as the plants they come from. They can be calming, energizing, disinfecting. They can help ease some of the discomforts associated with headaches, tummy aches, and viruses. They are versatile and can be used aromatically or topically or mixed in to create a new product. They are natural, and they are potent so they are effective and one bottle can cover a lot of uses. Despite all the benefits, there are some precautions to take to avoid the potential harms. Some of those are below. Essential oils come in a tiny bottle for a reason: They are potent and a little goes a long way. Before you jump in and get careless, here a few things to keep in mind before opening and using. Look up each oil before you decide to use it. Some oils shouldn't be used on skin exposed to the sun, some can cause breathing problems especially in young kids or in people with asthma. Do you research before using a new oil. And ditto for blends... know the individual oils in the blends so you know how to use it safely. Not even the milder oils and not even a couple drops in your water. Okay, maybe that's just me. This is not what you'll see posted all over Pinterest, but it's something to keep in mind. Oils have the potential of burning your esophagus and other harsh effects. (Remember, they're potent.) Before you start dropping them into your drinks, do so under the direction of a professional. They'll know how to do it safely and which oils to completely avoid. Dilute before use (avoid or limit using "neat"). Again, oils are potent (you might be tired of seeing me write that, but it's true and isn't said enough in articles I find online). They need to be diluted to prevent bad reactions. Plus, diluting them in a carrier oil helps them spread better and go further. Some milder oils might be used "neat" or directly on the skin without dilution; that should be done sparingly and in less sensitive areas of your skin. A salesperson is different than a medical professional or even an aromatherapist or herb specialist. Always consider who your information is coming from as you decide if you'll follow it. It's fine to get info and recommendations from a friend or essential oil salesperson; but don't take that (this blog post included) as sound medical advice, and double check with another source if something doesn't sound right. I like checking the website Using Essential Oils Safely, and there's a corresponding Facebook group, too. Lea Harris is a certified clinical aromatherapist who errs on the uber safe side, which I like. Her info goes along with the extensive information in Essential Oil Safety by Robert Tisserand, except she uses terms I can understand. 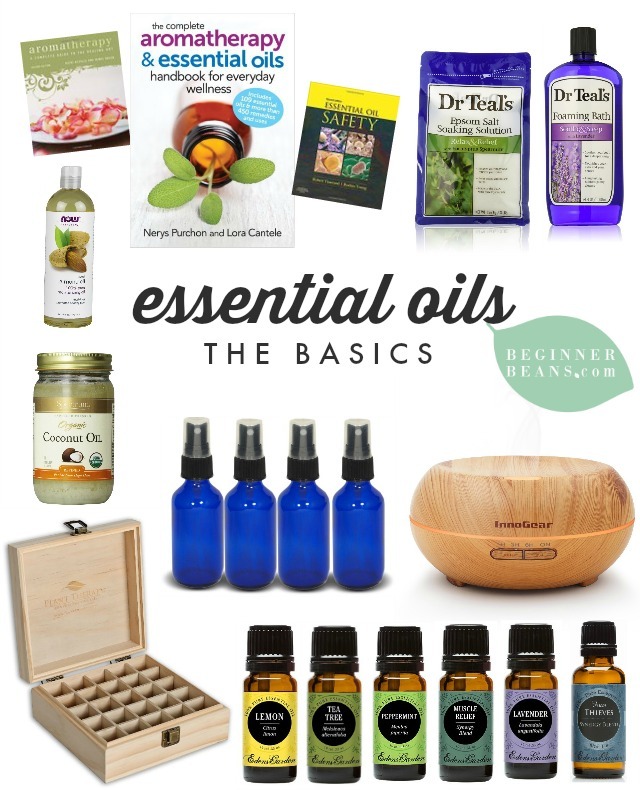 She also recommends The Complete Aromatherapy & Essential Oils Handbook for Everyday Wellness. A local certified aromatherapist suggested Aromatherapy: A Complete Guide to the Healing Art. Those are all good sources to check out when looking at using essential oils safely. I share more ideas for using essential oils with kids >> here. Some oils will say not for kids under a certain age. Most agree to avoid on babies. If you do use them on or around kids, use sparingly or majorly diluted and check each oil with a professional resource before using on kids. Don't overuse to avoid sensitization. Too much consistent use of the same oil or without diluting can lead to sensitization. Basically it's a negative reaction to the oils. Even an oil that you've been able to use regularly, your body could become sensitized and start rejecting. Oils are great; use them. But use them with care if you want to be able to keep it up. Oils and water do not mix. This is kind of a no-brainer that's worth mentioning. This is one of the reasons putting oils in your drinking water isn't a great idea. Give it a try and look at the water--the oils will gather on top and not mix throughout the water. So water isn't exactly a good way to dilute oils. If you're hoping to use them in a bath, you might try putting it in honey or use oil-scented bath salts to help it disperse through the bathwater. If you're wanting to make a liquid spray (i.e., cleaner or bug repellent), shake well before and during use. Use whole health, not just oils. Essential oils are not a magic cure-all and end-all for good health. If you can stay healthy by eating well-rounded meals, drinking lots of water, and staying active, then some need for essential oils could be prevented. Taking care of ourselves is always the best choice over relying on something, natural or not, to ease our symptoms. Essential oils can be used a lot of ways. The common are using them aromatically, topically, and mixed in another product. Topical: Put with carrier oil and apply to skin. Oils can benefit various parts of the body by absorbing into the skin. I usually do this by squirting a carrier oil into my palm (coconut, sweet almond, and jojoba oils are my favs), then adding a drop of essential oil. I rub my hands together then rub into my stomach or back or where it's needed. I usually do this as needed, rather than pre-mixing and storing. Aromatherapy: Diffuse, sniff from bottle, or add drop to material. The smell of the oils can improve mood, help a headache (hello, peppermint) or soothe queasiness (hello, licorice). This can be done by putting a few drops of the oil with water in a diffuser which releases it into the air over time (and can disinfect the surfaces surrounding the diffuser); you can add a drop to a stuffed animal or clothing (beware of oil staining or discoloring); touch the top of the bottle to your wrist or your finger and rub on your neck or behind your ears to smell throughout the day (do this sparingly to prevent sensitization); or simply sniff from the open bottle. I've made several products with essentials oils that smell great and are super effective. When I want to try a homemade product, I usually search for a couple recipes online then choose a combo that makes sense for me. Below are the few I've been using more regularly. Do a search online if there's a product you'd like to try homemade with oils. Bug Spray: This is an experiment that I'm still in the midst of. I mixed together something that didn't seem to work, then my friend sprayed her mixture on my legs and it not only stopped anymore bites but it also relieved the itching and size of the mosquito bites I already had. Hers was a vinegar/water mixture with eucalyptus, lavender, and tea tree essential oils and used heavily. Other oil options include mint, lemon, citronella, and eucalyptus. Homemade Deodorant: Its simple form is basically coconut oil melted and mixed with essential oils (I like tea tree for this) and combined with baking soda. You can see my full post about it including the deodorant recipe >> here. Face Spray / Toner: This is another experiment I'm still working on. I'm looking for something that fades my current acne scars and prevents future breakouts. I haven't had any breakouts with my current mixture, but still waiting to see if anything changes with the scars (that can take months, if at all). I'm currently using a 50/50 witch hazel / water mixture with a couple drops each of tea tree, frankincense, lavender, and melissa essential oils. Disinfecting Spray / Air Freshener: What I love about this is that it smells great, but it's also effective as a germ killer. I do 50/50 witch hazel / water, then several drops of either peppermint or citrus essential oils (depending on the size of bottle). I keep this in the bathroom for quick freshening / disinfecting especially before company, and it really helps that diaper smell in the trash that lingers even after the diapers have been taken out. All-Purpose Cleaner: I used to use straight vinegar and baking soda as my main cleaning agents for the bathroom and kitchen. I like having an all-purpose cleaning spray to more easily use the vinegar, it smells a little better (and has extra disinfecting qualities from the essential oils), and can still be used after scrubbing with baking soda. It's basically 50/50 water + vinegar with 10-15 drops essential oils per 2 cups mixture. Spray, let set, then wipe clean. Or scrub first with baking soda (especially in sinks, tubs, and showers), spray heavily with cleaner and let set, then scrub again and rinse clean. Or simply spray lightly over counters and let dry as a more natural Lysol alternative. See more about our natural cleaning products + routines >> here. Finally, here are some of our go-to oils and how we use them. This is simply anecdotal and should not replace your own research on the facts and uses of each oil. Learn about your oils before you use them! Tea Tree is a disinfectant, antibacterial, etc. I use tea tree in my homemade deodorant. It works great and I rarely smell B.O. as opposed to most other store-bought deodorants I've used. Tea Tree is also supposed to be good for acne and acne scars. I've used it in a spray for my face and my pillow. Peppermint is a hot oil that should be diluted and avoided with babies. I've diluted it in coconut oil to use as a Thieves alternative (see below) for my older daughter's throat and chest when she has a cold. It smells great diffused during the holidays, and I've diffused it to help disinfect the air and surfaces. I've put it in an all-purpose spray that really helps bathroom odors and especially the trash where we collect diapers. It works great for headaches. I sparingly touch my finger to the top of the bottle and rub into the back of my neck and my temples along the hairline (as far away from the eyes as I can get), which helps when I've got a migraine. Each citrus oil has its own set of benefits and uses. Grapefruit, sweet orange, and lemon are my favs. We use them somewhat interchangeably as a disinfectant that's safer to use around kids. 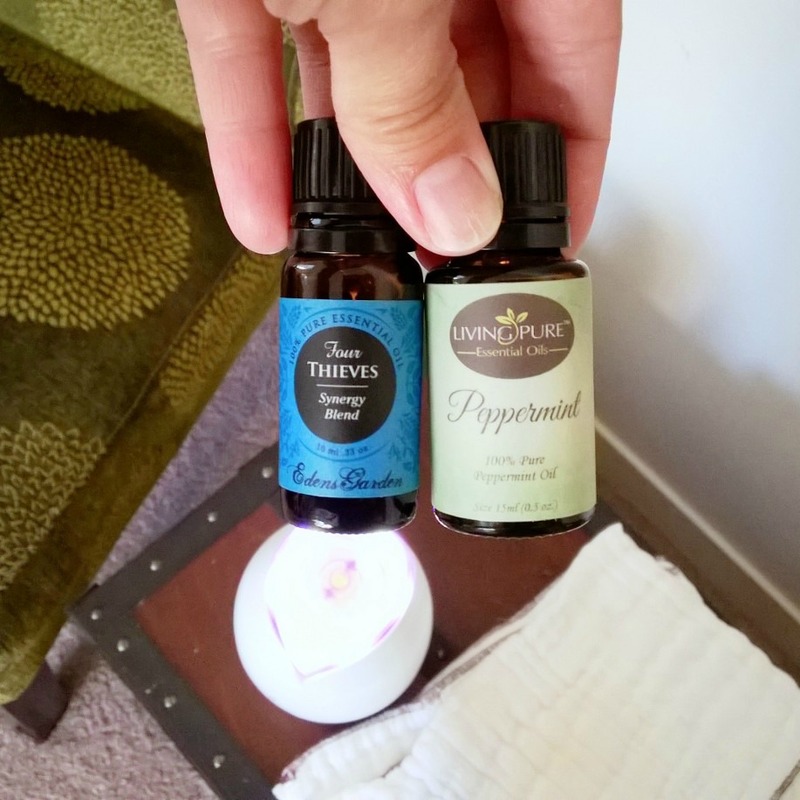 I love the smell when diffusing it, and it works great in a homemade cleaning spray. I've also made an all-purpose spray like the peppermint one that works for freshening the air and killing germs around the trash or in the bathrooms. Citrus oils are often photosensitive, so shouldn't be applied to skin that will be exposed to sun. Lavender is supposed to be a milder oil that can be used on kids, which is likely why it's in so many baby products. It's calming and can also be good on sensitive skin or even for a burn or cut. 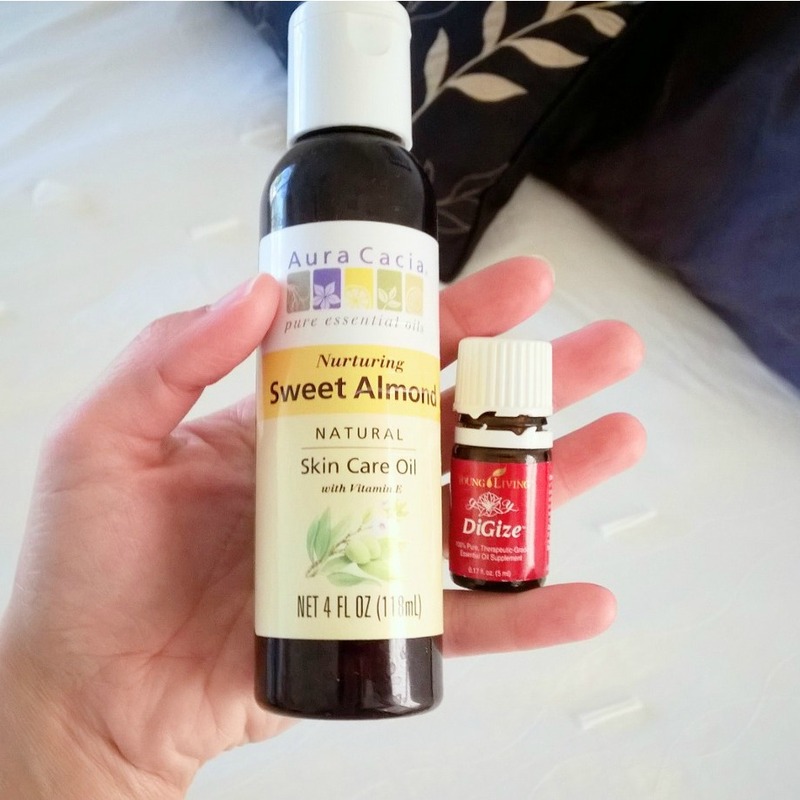 I've used a drop in a carrier oil to rub on my boys' eczema; we've diffused it, especially in the evening; and the kids love when I put a drop on their stuffed animals and throw them in the dryer with their blankets for a couple minutes. When the kids have restless legs or growing pains, I'll rub a drop with carrier oil into their legs then give them a heated rice pack. I also often add a drop of lavender with a muscle relief blend to rub into my stomach when I have monthly cramps. The muscle relief blend is called different things in different brands. It smells like Bengay cream and works great with a drop in a carrier oil and rubbed into any aching part of the body (i.e., shoulders, lower back, or stomach with cramps). That's pretty much the only way we use it, but it gets plenty of use. The thieves blend usually has thieves somewhere in the title even across brands based on some story about thieves using these herbs to keep themselves well when stealing from people with the plague. It's supposed to be great for disinfecting and getting rid of viruses. My husband and I will dilute it in a carrier oil and rub it into our throats or chest when we have a cold; and we'll diffuse it in the main living spaces or in our bedroom after the kids are in bed. It also makes a great disinfecting spray as a Lysol alternative--again, just spray and let surfaces dry before having kids in the area. The calming blends have different names and even different oil combos between brands. It's generally a soothing and relaxing scent that we like to diffuse even with the kids around. Sometimes when the kids have gotten restless at night I've put a drop in a carrier oil and rubbed it into their legs to help them calm down. The digestive blend seems to have worked great the times I've used it. Certain types of dairy bother me, and I've used it when I notice my stomach churning. I just put a drop in a carrier oil in my hand and rub into my stomach. The several times I've done this it's helped calm my stomach down. I've also used it when one of us has a stomach bug to help ease the queasy feeling. If you're wondering where you actually find essential oils and related products, there's a few options. In addition to the few oils you start out with and want to try, there are a few accessories that can help get the best use out of oils that are pictured above and linked below. As far as where you buy your actual oils, most of us know a friend who sells brands like Doterra or Young Living, I've seen some selection in our local natural / health food stores (ask around or do a local search online), and we've tried various brands from Amazon (I've been loving Eden's Garden essential oils and blends). You might even have a specific aromatherapist in the area that sells oils and could be a good resource when you have a question. I like Lea Harris' post on choosing where to buy, where she says while "you can certainly use any brand of essential oil safely, a company which provides unsafe usage recommendations points to something greater – lack of education about aromatherapy that can spill out in to areas that can affect the product itself." 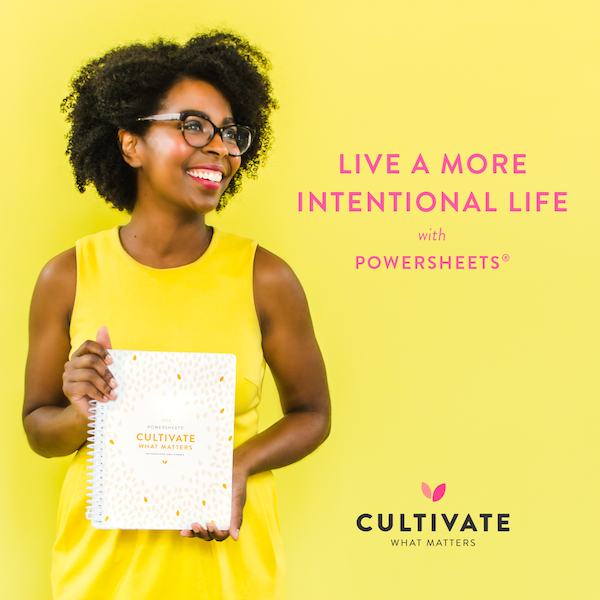 Checkout her post to see what makes a company reputable. We've used and like coconut oil, jojoba oil, and sweet almond oil. There are lots of others, but those are the few we use regularly. Jojoba is a light oil that absorbs quickly and I've even used as a face moisturizer. Coconut oil needs to be warmed a little to melt and spread (which can easily be done in the palm of your hand); we always have it on hand for cooking and it's the base for my homemade deodorant. Sweet almond is probably our second most used oil next to coconut. It's a lighter oil that absorbs quickly, but not as quick as jojoba; it can also be used as a makeup remover/face cleanser. We also keep white vinegar and witch hazel on hand which we dilute with water and add in selects oils for various sprays (disinfecting spray, bug spray, all-purpose cleaner, etc.). 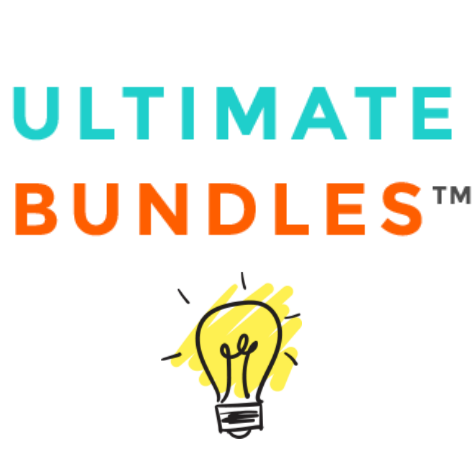 There are a variety of diffusers. The wood diffuser in the collage has good reviews and I love the look. Ours was gifted to us and I like that it can be turned on to an intermittent diffusing and that it has a light that can be turned off. You might opt for having more than one diffuser. We do fine just moving ours around where we need it. As your collection grows, a wood sorter box could come in handy. This is on my wish list, but we currently corral our oils in a smaller plastic container. Epsom salts aren't essential for use with essential oils, but I like Dr. Teal's products that are already scented with oils. Especially their bath bubbles and salts. You could also use your oils in your own bath products which helps distribute the oils in the bath rather than them just collecting on the top of the water. Oils need to be stored in a cool, dark place and shouldn't be stored in metal or plastic containers. 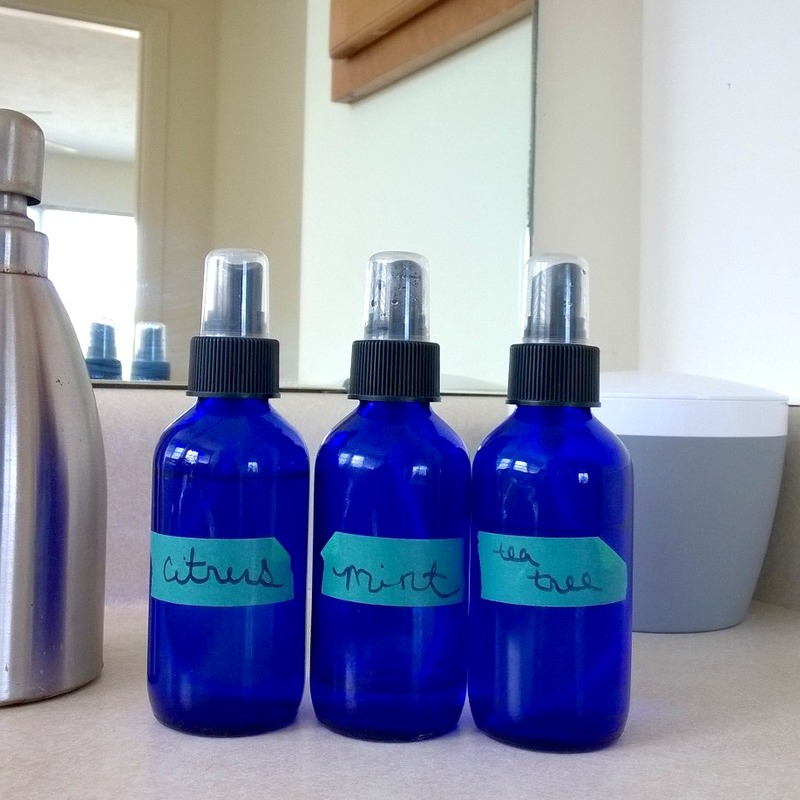 I love our cobalt glass spray bottles that I've used to mix cleaning solution, air freshener, disinfecting spray, bug spray, and face toner. I also use a glass jar to hold my homemade deodorant. The smaller 2 oz. jars still last a while for most sprays, but an all-purpose cleaner works better in a larger bottle. Above I mentioned a few guides I've seen recommended by certified aromatherapists: Essential Oil Safety by Robert Tisserand, The Complete Aromatherapy & Essential Oils Handbook for Everyday Wellness, and Aromatherapy: A Complete Guide to the Healing Art. There are lots of other sources, but those are a great starting point. 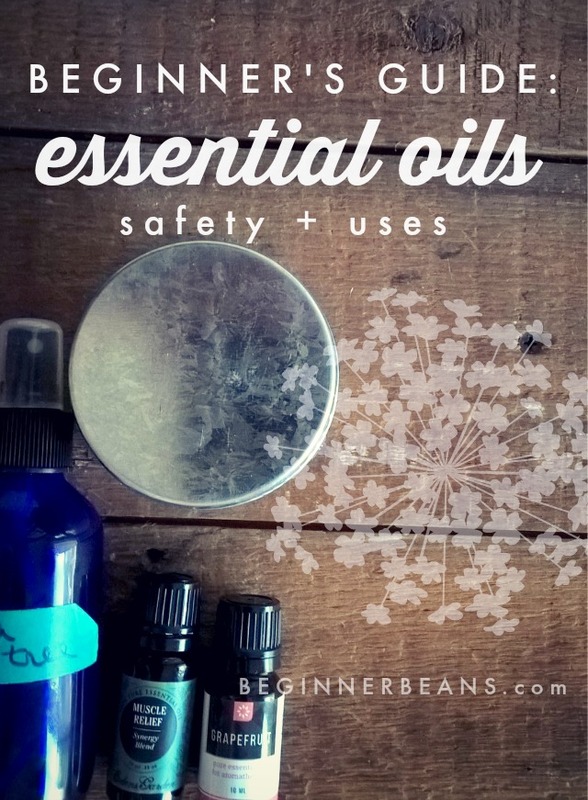 When it comes to using essential oils safely, that involves sometimes not using them at all. Especially when preventing sensitization or looking for a healthy option to drink. There are lots of natural options that work together for best health. Drink lots of water, eat a variety of healthy foods, get daily sunshine, and stay active. Those daily habits can a go a long way in feeling good and not needing extra intervention for relieving symptoms or experiencing good health. There is no magic pill for good health; it really is lots of little daily choices. Putting an actual citrus slice (i.e., lemon) in your water has health benefits and tastes good and has none of the risks of drinking essential oils in your water. You can also eat fruits and veggies that provide fiber and vitamins and minerals that aren't found in the essential oils taken from a plant. A good diet is a daily foundation to good health. I don't know much about teas and herbs, but they have additional health benefits and are used differently than essential oils. They can be another contributing piece to the natural health puzzle. When it comes to essential oils (and anything health related), I believe it's better safe than sorry. Do your research and do what seems the best for you and your family. If anything feels off, change what you're doing. When in doubt, check resources and ask true health / medical professionals. Also see my posts about using essential oils with kids and using essential oils for cleaning. Most of all, enjoy and oil on! 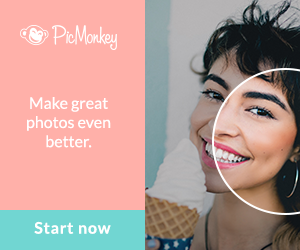 *Note: Affiliate links used in this post. 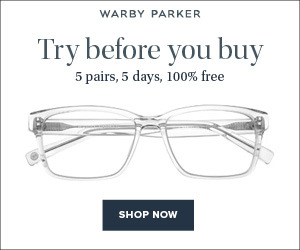 Any purchases made through these links could earn me a small commission with no extra cost to you. I only link to products we've used and like. I am not a direct salesperson for any particular product or brand. I am also not a medical professional; all things related to your health need to be shared with your doctor.